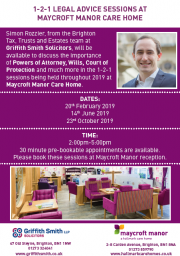 We are delighted to be working in conjunction with local Care Home, Maycroft Manor, on a series of free 1-2-1 Legal Advice Sessions. 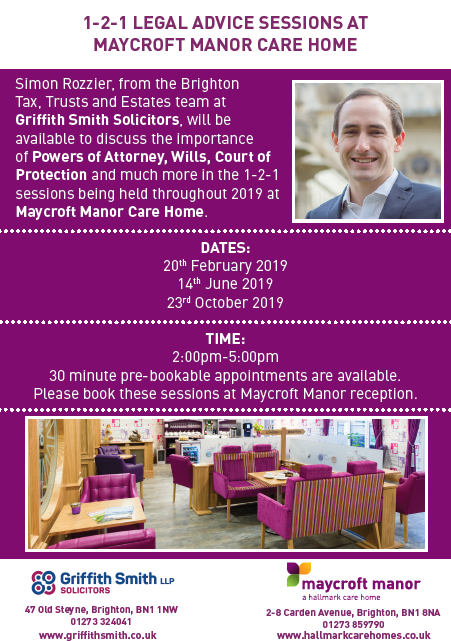 Simon Rozzier from our Tax, Trusts and Estates team in Brighton will be available to discuss the importance of Powers of Attorney, Wills, Court of Protection and much more in the 1-2-1 sessions being held throughout 2019 at Maycroft Manor, Carden Avenue, Brighton. For more information, please either get in touch with Simon Rozzier on 01273 324041 or Maycroft Manor on 01273 859790 or download the event flyer > Maycroft Manor 121 Sessions.